With version 9 and xConnect release Sitecore is setting its foot as a true leader in the market of omni-channel Digital Experience Platforms. Capturing omni-channel contact behavior and setting up automated and personalized omni-channel communication has never been so easy. Being secure and scalable WebApi service layer, xConnect makes it possible to push data from all channels and external business systems to Sitecore xDB, as well as pull data for analytics, aggregation and machine learning. In the near future we will see a number of xConnect integrations created to facilitate marketers establishing contextual and intelligent digital experiences. 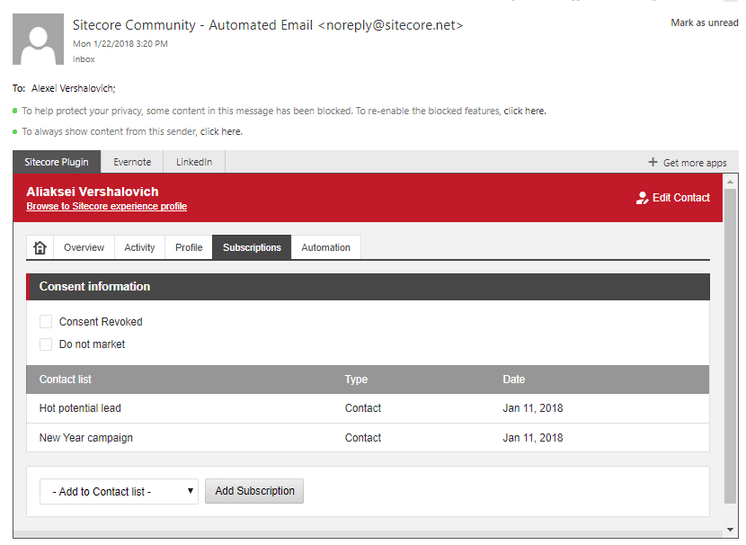 This post is an introduction to Outlook Experience plugin for Sitecore, one of the first xConnect integrated tools. A journey from anonymous contact to a lifetime customer often spans multiple channels, involves many decisions and actions and requires strong relationship developed between contact and brand. CRM systems are aimed to help managing such relationships. Leads and its interactions data is captured in CRM for various channels including Offline Stores and Call Centers, Partnership programs and Affiliate Marketing activities. Large enterprises would not survive without well-established CRM system in place. Two global leaders, Sitecore and Salesforce, partnered to build comprehensive and personalized marketing campaigns — from web content to email communications to mobile messaging and digital advertising. However, small and midsize companies often lack integration between their CRM system and Digital Experience Platform or CMS, they often lack a bridge between online and offline engagement. The idea to create simple and friendly app that will facilitate sales, marketing and service teams, running their company website on Sitecore, establish better communication and most important - record such communication with Sitecore - has been there for quite some time. Inspired by release of xConnect, at Brimit we realized it’s just the perfect moment for such tool and it would be a good demo for xConnect features. 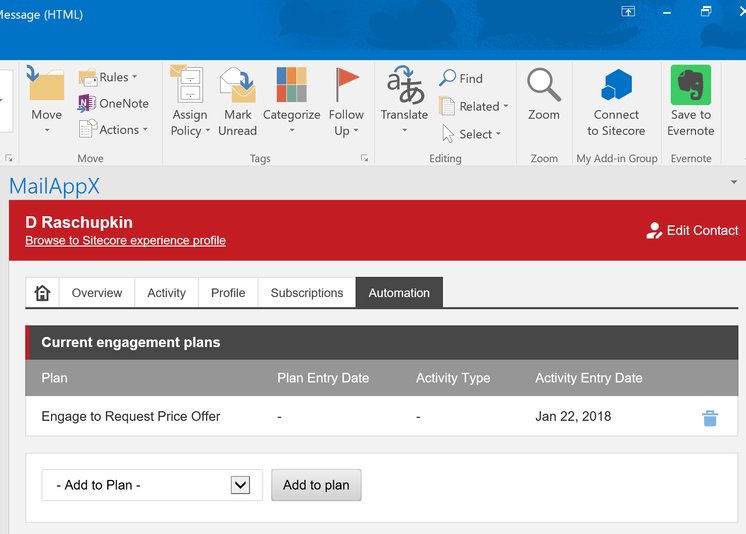 Outlook Experience plugin for Sitecore is aimed to help organizations track offline communication and contribute to the overall experience profile. Our goal is to help companies that lack CRM system or companies that lack integration between Sitecore and CRM system. We selected Microsoft Outlook (being a well-known office tool) as a background platform for our solution. 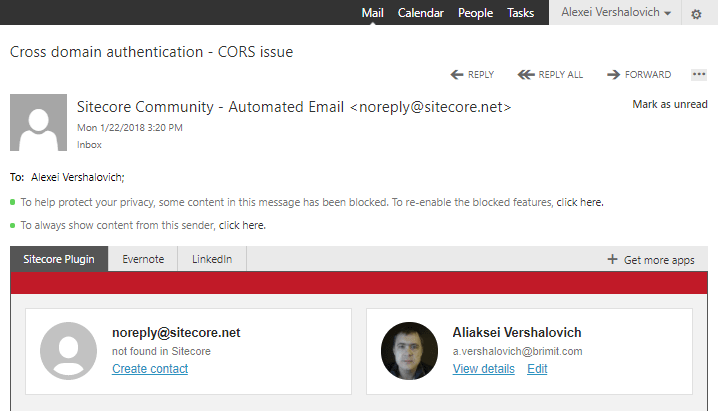 Outlook plugin for Sitecore can recognize contacts in the email and query their experience profiles from Sitecore. 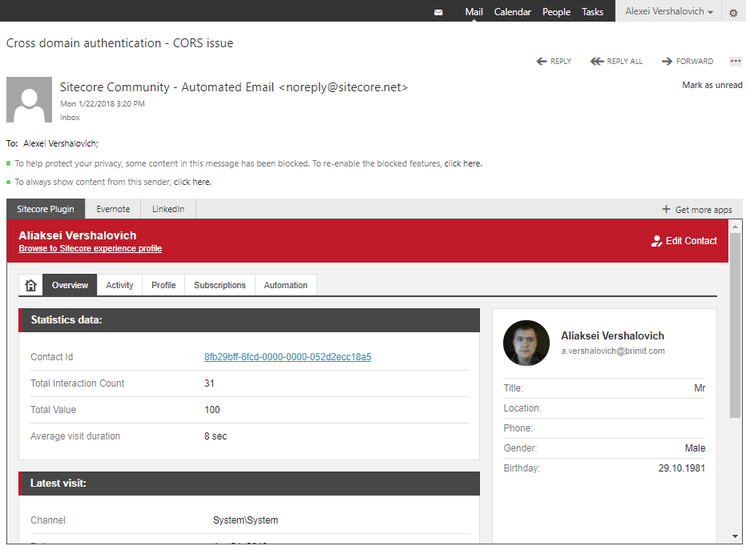 For any contact that is not identified in Sitecore with corresponding email it is possible to create a new contact on the fly. Browsing to View Details it is possible to explore contact’s interactions and entire experience profile right from the Outlook application (both Outlook online and Desktop). It is possible to trigger events, goals and outcomes with just a few clicks. Consider a scenario where car dealership center sales manager received Test Drive Signup request by email, confirmed it with the phone call and wants to record such interaction against “call center” channel. 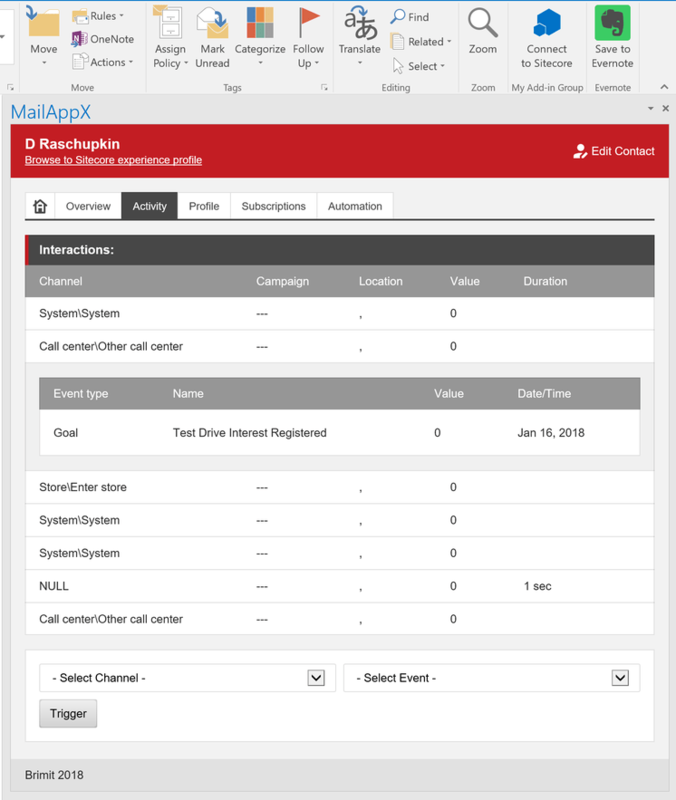 While interaction is a lot more complex entity and often requires more data, recording interaction against “offline/call center” channel will already give great insight for future communication with contact, contribute to engagement value associated with contact and potentially trigger automation plan enrollment. Now what if during communication with contact we learned something new about his needs and brand expectations? 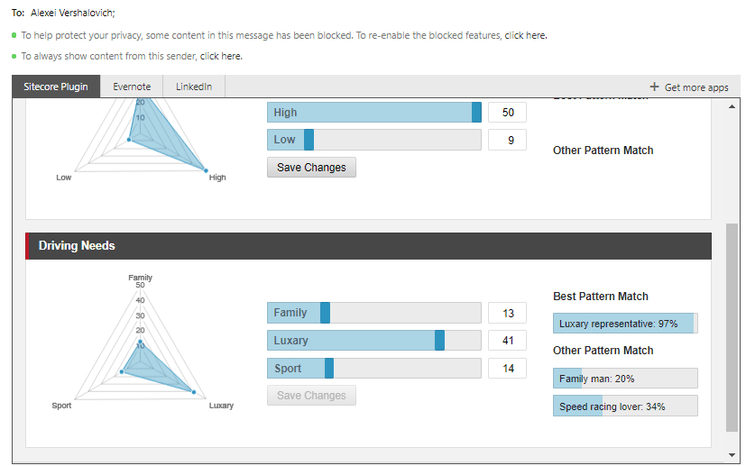 We definitely want to record such information with Sitecore for future personalization. Again, you can do it right from the Outlook plugin by changing contact behavior profile values. While plugin implementation is still in progress, we are happy to make a demo for the current preview release. We are looking for feedback on how we can improve plugin and will be happy to plan integration with your Sitecore 9 implementation.